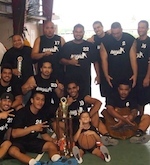 Samoana went into the high school varsity basketball title game this past Thursday as favorites to repeat as champs. The general consensus among the secondary school basketball fraternity, the Sharks are one of the best basketball teams assembled by a local High school in many years. "They are like the Lakers of the NBA," says another High School coach. "They have all the best players in every position. Samoana was totally stunned by Leone in the first half, and this year's High School's Basketball top scorer, Lotonu'u Segai, recorded the lowest scoring performance of the season. He was held to 5-points (all in the first quarter) when the Lions used a zone-defense, but quickly doubled him up inside the perimeter. However, Samoana coaches changed their attacking point in the second half, and switched to a full-court press, that changed the momentum of the game. They outscored Leone in the third quarter, 18-6 and in the final period, 16-7. Samoana scored 34-points and allowing Leone to only 13-points in the second half. "Coaches can't do anything if they wanted to change their schemes and they can never jump start them with his plans, if the players don't have the capabilities to execute it. That is why Samoana is different than the rest of other high school teams, especially with this group, they are good players," continued an admiring high school coach. Samoana gymnasium was packed to capacity with supporters for both teams. There were also faculty and staff from both schools were on hand to control their supporters over-celebration and excessive jubilation, and taunting, which always led to a big brawl, especially when these two school rivals meet. And it doesn't matter which sport they cross paths, there is always this built-in tension between the schools. Both teams hits four (4) 3-pointers. Leone guard #25, Sai Totive hit two 3s, and the Most Valuable Player award went to Samoana guard #4, Ludwig Svartholm. He took over and made a difference in the game in the second half, when he scored 19 of his 21 points including a 3-pointer and he also left Leone players gasping for air, in evading the Lions who tried to contain him. Leone's top scorer, Center #55- 'Ese Selesele, had a tough time sinking his shots, he had scored just 7-points for the whole game ,5 in the second quarter and 2 in third. The Leone bench contributed just 2 points by Solomona Aigamaua, and the rest were non-productive. Samoana's other guard, Faimalo Tapui, came off the bench and hit a 3 in the second quarter, and sank two from the line and jumper from mid-range in the third for his total of 7-points. Samoana Power-Forward, Dimitritus (Simi)Toeaina, did a great job in grabbing the ball at both ends of the court, for a total of 18 rebounds, and scored 4-points. During the half-time break, Samoana coaches made adjustments utilizing top shooter, Lotonu'u Seagai. In the second half, coaches Maselino and Sonny used Seagai as a decoy. Once he moved to the top of the key, two Leone players would converge on him and thereby freeing up Svartholm for deuce. Leone created opportunities on fast-breaks, steals, and rebounds, but they kept missing open shots, easy lay-ups and free-throws, in the second half. While the upbeat Sharks were biting their way ahead with for a double-digits lead while the game clock was ticking its minutes and seconds away.